Plug-and-Play Touch Screen POP Kiosks Which “Grab” Your Customers Attention . With over two decades leading the industry, we at Avante have once again taken the industry by storm with the performance of our touch screen POP kiosks. The new media age has done plenty to shape our lives, but beyond shaping our lives, studies show it is shaping our behavior. Our attention spans have changed. For this reason, we constantly need more and more stimuli. This is the very reason touch screen POP kiosks and display systems are working so well for many of our clients. Avante POP Displays can design and build you an affordable, attention drawing, touch screen POP kiosk that uses video or other media to get your message through. An attractive, interactive, display solution will boost sales by drawing consumer attention to the video presentation, thereby promoting your product. It is so easy to use – completely plug-and-play once it arrives at your location. Marketing studies have shown that 70% of branded sales are the direct result of foot traffic. Retail sales are heavily impulsive. Our touch screen POP Kiosks work as a sales force that flags down business at astonishing rates. In House Design: Design is done in-house. Avante designers continue to lead the industry, as can be seen by our work with Dish Network, Body Glove and Thermablade. In House Production: Production brings the overall sales concept to life. We at Avante realize this final step of the process is arguably the most important. The polish and precision of the display speaks to the integrity of the product. We know that our production team will provide you and your company production quality that meets and exceeds your expectations. 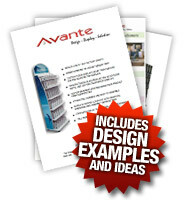 Eco Friendly Materials: The future does matter to us at Avante — the future of your business, the future of our world. As a result, we source the most eco friendly materials available without compromising ANY of the overall design of the display. Industry Leading Performance: Without a doubt… the most significant reason to consider Avante – our displays simply outperform our competitors’ displays. Success stories are what drive our business. It is stories such as the one above, that have cemented our place as the first name in interactive, touch screen POP kiosks and displays. Learn more about our work with Touch Screen POP kiosks in our brochure.